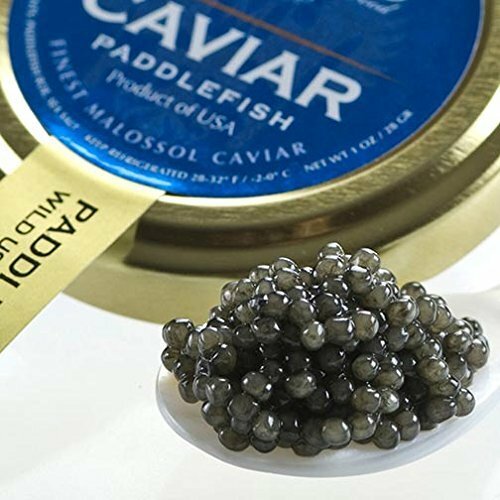 Our specially selected Paddlefish Caviar is a great addition to our caviar pantheon! It is considered a cousin to the Caspian Sevruga, to one of the highest priced varieties of caviar! Delectably fresh and exceedingly aromatic with that wonderful robust, bold, complex ocean flavor, our Paddlefish Caviar ranges in color from light to dark steel gray. It has medium-sized pearls and firm texture. Just try this caviar with our signature blinis, with Cr?me Fresh and you will love it! Caviar DOES NOT contain Pesticides, added Hormones or Antibiotics. Our Paddlefish Caviar contains Omega 3?s, Vitamin A, B12, E, Calcium, Selenium and Iron which helps to promote strong bones, teeth and a healthy immune system. We guarantee Overnight Delivery with Ice Packs to preserve freshness. Note: the product is perishable and should be stored in refrigerator, 32-38F. Seamazz Easy Peel White Shrimp, 16/20 Count -- 10 per case. Seamazz Easy Peel White Shrimp, 21/25 Count -- 10 per case. Seamazz Easy Peel White Shrimp, 26/30 Count -- 10 per case. StarKist Chunk Light Tuna in Water, 48 Ounce -- 6 per case. Trident Seafoods Skin On Bonless Swordfish Steak - 16 of 10 Ounce Pieces, 10 Pound -- 1 each. Trident Seafoods Skin On Bonless Swordfish Steak - 40 of 4 Ounce Pieces, 10 Pound -- 1 each. Trident Seafoods Skin On Bonless Swordfish Steak - 26 of 6 Ounce Pieces, 10 Pound -- 1 each. Trident Seafoods Skin On Bonless Swordfish Steak - 20 of 8 Ounce Pieces, 10 Pound -- 1 each.